Proprioceptive deficits routinely occur in conjunction with articular injuries. The acetabular labrum contains free nerve endings and sensory organs. It is believed that these free nerve endings contribute in no-ciceptive and proprioceptive mechanisms.16 The acetabular labrum also improves the stability of the hip joint by maintaining a negative intraarticular pres-sure.17 With injury to the labrum, this negative pressure is lost and stability of the hip is adversely affected, inhibiting normal motor response and decreasing neu-romuscular stabilization of the joint. The aim of pro-prioceptive retraining is to restore these deficits and assist in reestablishing neuromotor control. The elements necessary for reestablishing neuromuscular control are proprioception, dynamic joint stability, reactive neuromuscular control, and functional motor pathways. Joint positioning tasks early in the rehabilitative process can enhance proprioceptive and kines-thetic awareness.32 More advanced proprioceptive neuromuscular techniques incorporated in functional patterns of movement or modified ranges may be acceptable transition exercises, depending on the symptoms and status of the hip. FIGURE 17.26. 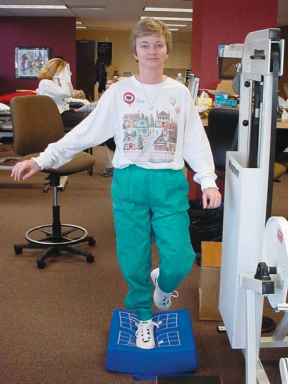 Reestablishing neuromuscular control may begin with simple static balance maneuvers evolving to single stance with balance devices with or without visual input. FIGURE 17.25. 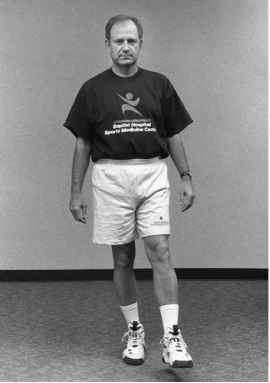 Controlled single-leg stance exercises facilitate pelvic toning and stimulate proprioceptive and balance functions in a closed-chain fashion. ference to the lower extremity in a manner that lessens the shear and translational forces across the joint surface.33,34 This begins with simple static balance maneuvers, starting with full stance, and evolving to single stance, with and without visual input (Figure 17.25). Progression is then made to a combination of balance and strength activities. Bilateral heel raises and mini-squats are progressed to unilateral heel raises and mini-squats. More advanced closed kinetic exercises such as increased partial squats, lunges, and dynamic weight shifts are encouraged initially in the pool. Low-force, slow-speed, and controlled activities may be transitioned to high progressive force, fastspeed, and uncontrolled activities if the joint allows without becoming overstressed. For example, balance devices, mini-trampolines, and unlimited creative upper extremity activities while balancing can further challenge the neuromuscular system (Figure 17.26). FIGURE 17.27. Beginning core stabilization emphasizes training of the trunk musculature to develop better stability and abdominal control. strength of the lumbopelvic-hip complex. 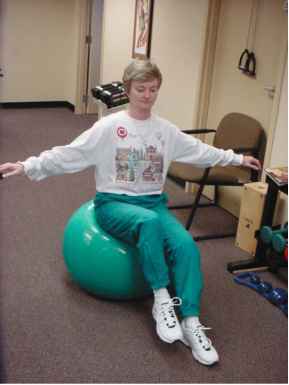 The core stabilization system must be specifically checked as part of the assessment and challenged as part of the rehabilitation program (Appendix E). An effective core stabilization system and strong lumbopelvic-hip musculature complex as an integrated functional unit is important for efficient weight distribution, absorption, and transfer of compressive forces. FIGURE 17.28. 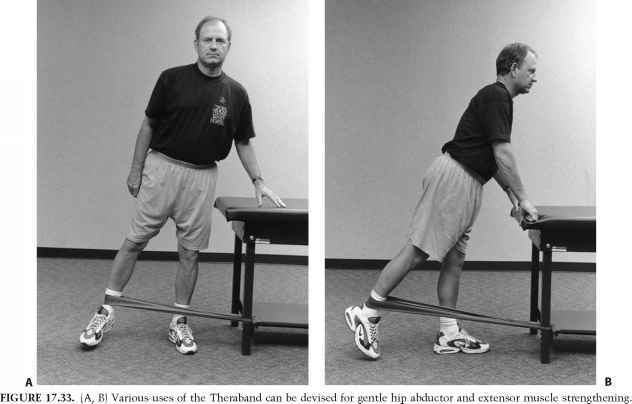 Initial core stabilization on gym ball may progress with hip flexion and knee extension. FIGURE 17.29. Depending on the patient's tolerance, the stabilization program may progress to complex on an unstable surface without visual input. cise program may progress from slow to fast, simple to complex, stable to unstable, low force to high force, and general to specific34,35 (Figures 17.28, 17.29). FIGURE 17.30. Pilates exercises with use of a Pilates Reformer can be an adjunct to progression during the dynamic stability phase of rehabilitation, facilitating improved flexibility, joint mobility, and strength. FIGURE 17.31. 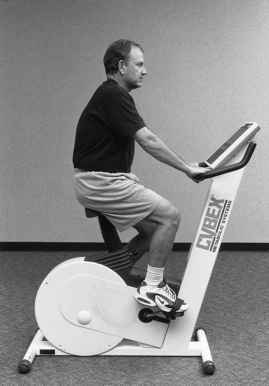 Used properly, a stationary bicycle can be useful to enhance smooth, fluid joint motion. The resistance is kept low. Initially, the seat is raised high, and then lowered as mobility improves. FIGURE 17.32. 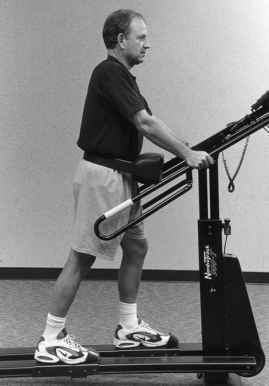 Performance on a NordicTrack or Elliptical Crosstrainer is better tolerated by some than others. Both are excellent devices for gradually enhancing endurance and strength, maintaining low impact. 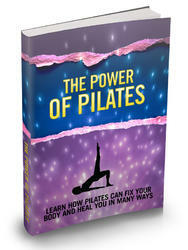 Learn How Pilates Can Fix Your Body And Heal You In Many Ways. 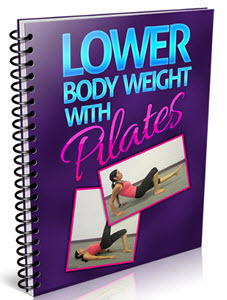 Pilates has gotten to be a common way to exercise. Pilates is a process that centers on core strengthening, balance, and flexibility. 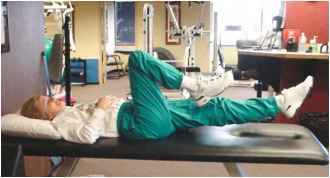 These principles are a few of the same principles utilized in the rehabilitation of a lot of common orthopedic issues.